Somebody switches on the air conditioning in the studio, and so the first sound we hear is an unearthly whoosh; perhaps the suspended spirits of “A Day In The Life” returning to active life, or, more pertinently, a reminder that Ritchie Blackmore was once a member of Joe Meek’s repertory company. This is hard rock, for sure, but a very different stripe from that of Sabbath; Ian Paice’s drums rush into the title track with surprising, deft lightness – suggesting rhythm through imaginative cymbal and snare triplet redeployment rather than thumping it down, he is something of a Billy Higgins to Bill Ward’s Ed Blackwell – and Roger Glover’s bass walks confidently astride the rhythm, for example, in the transition leading up to the third verse, or heaving, seasick, over Paice’s paradiddles in the final chorus. Ian Gillan’s vocal is controlled, curious, and even though it yields the expected scream at song’s climax, there is nothing gratuitous or exhibitionist about his performance; it is recalled voodoo rock ‘n’ roll (“Magic woman wreckin’ up my soul” – that old Wolfian duality). Jon Lord’s Hammond moves with a rather stiff confidence between stealthy free swirls and square-cut “Land Of 1000 Dances” quotes. Blackmore’s guitar stays in the middleground, watching, waiting. The whole comes across as a seemingly more agitated but simultaneously more contented “Paranoid.” The tambourine under the final organ drone tells us, as if we didn’t already know, that this is an uncommon brand of group. 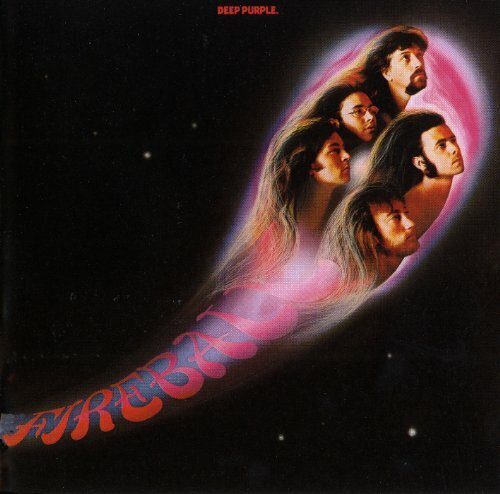 Fireball took most Purple fans by surprise on its release, even though the group’s fanbase was by now large enough to send it to the top in its second week of release. Where were the “steamers” and “belters” – the record’s “Speed King” or “Child In Time”? And what the hell did they think they were doing with “Anyone’s Daughter”? Fireball also became the latest example of a recurrent Then Play Long phenomenon where a classic album does remarkably well, building up a gradual following, but never quite well enough in any given week to top the chart – whereas the follow-up, with that entire following now alerted, ends up being the album written about. Deep Purple In Rock remains a set text for rock students to this day, and although it remained on the chart for some sixteen months, it never got past #4 (as a result of Simon and Garfunkel, various Beatles and Black Sabbath). From all accounts – most adroitly summed up in Simon Robinson’s magnificent essay for the 25th anniversary CD reissue – the group were coming under some pressure following their newly found success, not least to provide an equally successful sequel to In Rock. Furthermore, a hectic touring schedule meant that they had little time actually to write or record new material; most of Fireball was done on the turn of a dime, at various studios in various locations whenever they could find a day or a week off. There was the expected retreat to the country – a rented farmhouse in Devon – but the band spent far more time in the pub than working. Everything took its toll; Blackmore and Gillan growled “I’m the gaffer” at each other at regular intervals, there were illnesses, some psychosomatic and some not, and gigs ended up having to be cancelled in order to get some studio time. The results are rather unexpected. Very rarely is Fireball a straightforward hard rock album; instead it is the sound of a group, already readily comfortable with each other (at least musically), trying out different things, new approaches. The rogue “Anyone’s Daughter” was actually the first track finished for the album, and you can hear the writer’s block tension slowly melting in the long tuning-up intro before Blackmore’s guitar and Lord’s piano happily gambol into a country-rock shaggy dog story straight out of John Wesley Harding, with Gillan doing Adam Faith as Budgie doing Dylan. Gillan in fact has great fun with the absurd lyric – “throwing up a brick,” “banged my head,” his asides of “Shame and torture,” “Yes I did – it was nice” – and Blackmore trots out a convincing Chet Atkins pastiche in his solo (perhaps he was remembering the Outlaws’ 1962 Dream Of The West album, although he himself didn’t become an Outlaw until the following year). “Whaddya think of that?” Gillan hiccups as Lord scribbles a hasty piano coda. A forlorn novelty? Possibly, but it did the trick of loosening the band up for working on the album proper. Happily Gillan doesn’t take himself remotely seriously, especially when he’s being deadly serious; “No No No” is a great nose-up to straight society as well as a running commentary on band relations; the song sets itself up as a midtempo howdy-down boogie (but watch that unearthly Blackmore shiver at the beginning) before – amazingly – letting the funk in; Glover has ascribed Blackmore’s main influence on this track as Shuggie Otis, which makes perfect sense – the latter’s Inspiration Information, including the original of “Strawberry Letter 23,” was one of 1971’s big underground hits – as Blackmore again adopts a strategy of long, measured notes, as though peering at them in a gallery, while periodically hunching in and out of the group; very much in a Peter Green mood. A subtle titular chant builds up steam as Gillan races through all the options open to them, and mankind (“Is it getting better? No no no!/Do we love each other? No no no!/Must we wait forever? No no NO!!”). “Looking at them all, it feels good to be a freak!” he observes (see also, eventually, “Wham! Rap”). Gillan’s “No”s are alternately woebegone and defiant, and his ad libs (“not at all,” “it ain’t us”) ideally timed, dramatically. Lord’s Hammond solo is conventional but builds up very nicely; following a brief guitar/organ unison passage, Blackmore’s guitar begins to stutter under the final verse. Lord’s organ thrives under the last chorus, well offset by Paice’s abrupt explosive comments. Gillan issues the scream and grunt which bookend the truly liberated, and Blackmore meets him halfway to sign the song off. “Demon’s Eyes” is the nearest the record gets to a “Black Night”-style stomper; it bears the same lumbering tempo. Gillan’s groan in each chorus is sublime – Ahab just having missed netting his Moby – and Blackmore’s deadpan five-note descent undercuts any suspicion of solemnity. Once more, the band, especially Lord, demonstrate an unexpected panache for funk, although Gillan’s complaints go all the way back to Jimmy Reed (“Slip ‘n’ slide round my bray-yay-yain!”). He gives a conspiratorial “You KNOW you’re insane” wink. Blackmore solos and now it’s Gillan’s turn to stutter – “Sli-eye-ide!,” “You’re SO-WOWOWOWOWWO!” in the manner of a mountain goat having just lost its footing on the Eiger. Blackmore keeps up relentlessly, like the most loyal of sherpas. Side two offers three more exploratory setpieces. “The Mule” demonstrates that Purple still had more than one foot lodged in the late sixties; after electronic/percussive hisses, the tune comes in, very similar to Hendrix’s “Third Stone From The Sun” but with the drum pattern from “Tomorrow Never Knows.” Gillan doesn’t do that much here, but his one verse nails down a howl at modern slavery which any 1971 factory worker would immediately have understood. Lord’s Hammond phlanges and goes Eastern in a vaguely Floydian direction, but Blackmore quickly shakes up any space trip notions with some furious rock riffing, accompanied by Paice’s swift stickwork. Then the modal groove returns and Blackmore’s guitar reluctantly shudders into space. Following a final thematic statement, Lord’s now unadorned Hammond returns, with its ascending chords (into space, naturally), before it is wiped out by Paice’s thundering electrical storm of hailstones. The opening hisses return as a bookend, and as a return ticket. “Fools” is the album’s most notable track; tick tock cymbals and patiently ruminative guitar and organ set the atmosphere, in a more forlorn variant on the intro to “Child In Time,” before the song erupts into being and Gillan utters more homilies on the dreadful state of 1971 humanity. After the first chorus the song breaks down into a hard drum/tambourine break – someone needs to sample it – before resurfacing into the broader skies of its second verse. Once more, Gillan is in agony – “It’s in my bray-ya-yain!,” echoed by four quick bars of 8/8 from Paice – and the second chorus is further outlined by some spectrally descending organ figures. But then the song does something unexpected. The drum/shakers/tambourine breakbeat returns – Paice very slow and deliberate in his pacing – and Blackmore slowly rises out of the background, at first sounding as though in remembrance of Hank Marvin with his extended, doleful notes. But the main body of his solo has no real precedent in this tale; deploying the volume control pedals, his guitar stays low, mourning, like a ‘cello marooned in a spaceship, with self-accompanying drones. Heavy metal? This is more like the Mogwai/Do Make Say Think variety of post-rock, a quarter of a century ahead of schedule; the guitar detaches from its surroundings, its roots, takes flight. There is no body to the passage, and we are looking at more than simply a prelude to the Edge’s look-no-hands approach. Then the song rambles back into view – complete with “Hey Joe” paraphrases – Blackmore now snarling and sliding, his guitar’s teeth all a-chatter. The song then dies down to a processed, gnarled sequence of organ and guitar. If “Fools” does suggest some kinship with Hendrix’s work on The Cry Of Love, then the closing “No One Came” suggests what I’ve suspected about this year of rock; namely, that there remains a great deal of mourning for the Seattle man. The song is a pacy rocker, almost “Stone Free,” but again with more funk in its petrol tank. Gillan has a fine time, semi-speaking his semi-coherent rant, with sparks flying at our ears like an occasionally observed welder (“Someone said, what’s he gonna turn out like?/Someone else said – never mind,” “I’m a freak,” “My pretty face just looked out of place”). Blackmore floats in and out of the song and Lord solos on the cliff face of the song’s downwardly helter-skeltering riff (or helter-skelping, given Gillan’s part-Glaswegian family origins). “WOOOAAAAIIII!” exclaims Gillan near the end. “Where’s my Robin Hood outfit?” he demands. The song appears to come to an end, but guitar and keyboards hang in suspended animation before Blackmore sweeps back into the main riff; the song fades out with backwards improv piano from Lord overriding the rhythm. So what to make of Deep Purple as 1971 knew them? Although clearly coming out of the hard rock prism, their headspace is manifestly a different one from that of Sabbath, or even Zeppelin. They are more fleet of foot than the Sabs; all five had been around the block more than once and their approach has far more in common with a jazz or funk group than anything out of rock; think perhaps of a rockier variant on Booker T and the MGs. The content of Fireball, given its genesis, is necessarily haphazard and inconclusive, but its explorations are borne out of joy and natural curiosity. They have the chops, but, unlike ELP, don’t feel the need to display all of them simultaneously at any given second. In addition, Jon Lord’s keyboards clearly mark them out as different. Most importantly, there is an immense amount of humour in their work, a good-naturedness which belies their history of multiple spats. 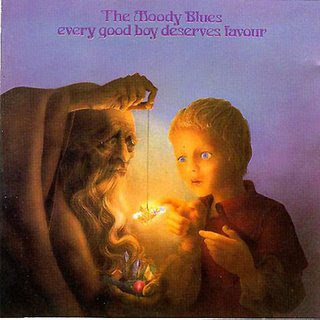 Jon Lord considers it a better record than In Rock; it is certainly the most overlooked of the great Purple trilogy of 1970-2 and the one most in need of urgent revisiting.